Packaging Season: The Problem with Packaging? A typical weekly food shop requires an intensive browse of the stretching supermarket shelves. A single pair of eyes will filter the thousands of clever brands, engaging product packaging, enticing food photography and descriptions, to assemble a trolleyload of foods which satisfy the compromising taste of brain and belly. Considering that a single shopper could unwittingly filter forty different brands of the same product down to a single choice in a matter of seconds, is an astonishing testament to the power of appetite combined with visual influences. As a food manufacturer, it is an element of product development and sourcing that we are particularly conscious of. 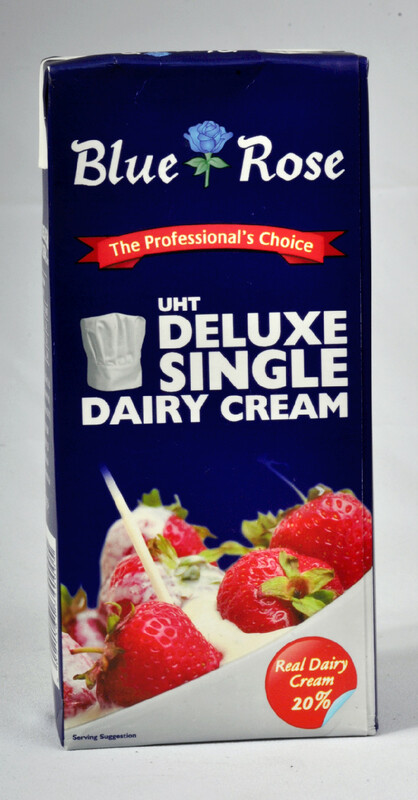 St. Ivel, Dairy Pride and Blue Rose: Single Cream brands sold by EuroFoods. Which would you choose? A consumer deciding a product is suitable for their needs is the final act in a series of questions, requirements and research on our part, which are necessary to ensure that the product is suitable for consumption. For a consumer, the problem with food begins and ends with a choice. For a manufacturer, there must be systematic thoroughness and continuity in the portrayal of information; the problem with packaging is with communication. A good film director will realize the necessity of continuity. Certain elements are unchangeable to ensure clarity of communication. In a single scene, lighting, weather, actors, props, music and location become landmarks. The only changeable factor is the story. If a single scene were interrupted by spats of brilliant sunshine, torrential rain, blaring rock music and sudden silence, the viewer would quickly question the quality of the film and become totally disengaged. Similarly to the meticulous film director, a good food manufacturer must abide by a set of continuity rules to ensure consumers are not distracted by mistakes, or left with gaps of information. These rules are set out by the EU and the Food Standards Agency. To comply with the FSA, all information with regards to a product must be clearly printed to ensure consumers understand exactly what they’re eating. If this information is incorrect, or missing, there is nowhere to hide from a newly aware public. High profile television campaigns, such as Hugh Fernley Whittingstall’s ‘Chicken Out,’ have made it the norm for consumers to question products and demand more information than ever before. For manufactures, truthfulness and clarity have become a fashionable virtue. The “Euro Foods’ Packaging Series” intends to discuss the role of food packaging, exploring legal requirements, marketing and food safety. It will also consider Euro Foods’ environmental issues, sales and history with product packaging, concentrating on the evolution of our brands in relation to these rules. We intend to enlighten our consumers about the way we give information and how we decide what to include in the range . Keep checking the blog for future installments in the food packaging series. The first article, ‘Information, Education and Communication,’ will be listed later this week.